The minimum order is £300 of your chosen currency. 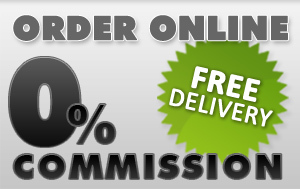 No, each currency needs to be completed individually and a handling fee will apply to each order below £700.00 value. Your internet banking will not find us under the “pay a company” option as it does not feature Limited companies. You should pay through the “pay a person “option. If you have used us before it is ok to use your previous order number as a reference if you cannot change it. We must receive your payment within 1 business day of your order being placed. No deliveries are despatched until we receive cleared funds. We will email you confirming the details of your order and details of our account for you to send payments to. It is important that you read this completely as it contains important information about your order and how to pay us correctly. Please ensure you check your junk/spam before being concerned about non receipt of these emails as your ISP may have blocked them and in some cases prevented you from receiving them at all. There are no charges, commission or postage to pay on your order unless your order is below £700 which will incur a £5.00 handling fee. If you specifically require a particular note denomination or a delivery time outside of the Royal Mail standard schedule then a charge may apply. Please contact us for clarification.